I Have Twenty Fingers …and 159 other common Polish-English Errors is a new resource book by materials writer and English language teacher Matt Purland. This book is aimed at Polish native speakers who are studying English as a second or foreign language. It contains four error-correction tests with answers and full discussion of each answer, including Polish translation of the error sentences. The aim is to help Polish students to understand WHY they make the same errors again and again, thus helping them to eliminate those errors. There are two special sections: nouns that are countable in Polish but uncountable in English, and 50 common false friends in Polish and English. Polish teachers who teach Polish students and also wish to know more about common errors in Polish and English – from an English native speaker’s point of view! Anybody of any language who wants to improve their knowledge of English, since many of the errors also occur in other languages. Matt Purland is a professional English teacher and writer from Cambridge in the UK. He has worked with Polish students at all levels since 2004. He has been living and working in Poland since 2007. His special interests include pronunciation, writing teaching materials, and error correction. This is his twenty-fifth resource book. For more great books by Matt Purland, click here and here! ‘Great book! I love these kinds of books, I wonder if you could make this a series? I’d love to see something like this about Russian and I’m sure other teachers would be happy to have such a detailed guide to their languages. ‘Matt Purland’s book, I Have Twenty Fingers, is an invaluable guide to the Polish language for teachers of English or even students learning English on their own. It is essentially a detailed analysis of the most common errors made in English by Polish speakers. Three things make this book truly superior. First of all, each error is explained clearly and simply with reference to the differences between Polish and English. The explanations are also supported with an example sentence in Polish, the correct version in English, the literal translation into English and the specific error. ‘Second, the book is incredibly thorough with no less than 160 errors discussed. In the first section, Matt breaks the errors down into categories such as “false friends”, “errors with tenses”, “direct translation errors”, and “one word in Polish but two words in English”. The first section also contains a brief list of each error to refer to quickly. ‘Finally what makes this book really useful is the tests. Beyond the explanations, Matt provides 4 tests that teachers or students can use to diagnose their errors. Students find the error in the English sentence and then the answer key leads them to the explanation in the book if they answer incorrectly. ‘Matt Purland is a prolific writer and he has done it again! His latest book is entitled I Have Twenty Fingers: …and 159 other common Polish-English Errors. This book is an extremely comprehensive, well-researched and brilliant must-have resource for Polish learners of English and teachers. Matt meticulously documents 160 common errors made by Polish speakers. ‘I like the approach and the concept very much. I work in Poland, and this book has helped me a lot! 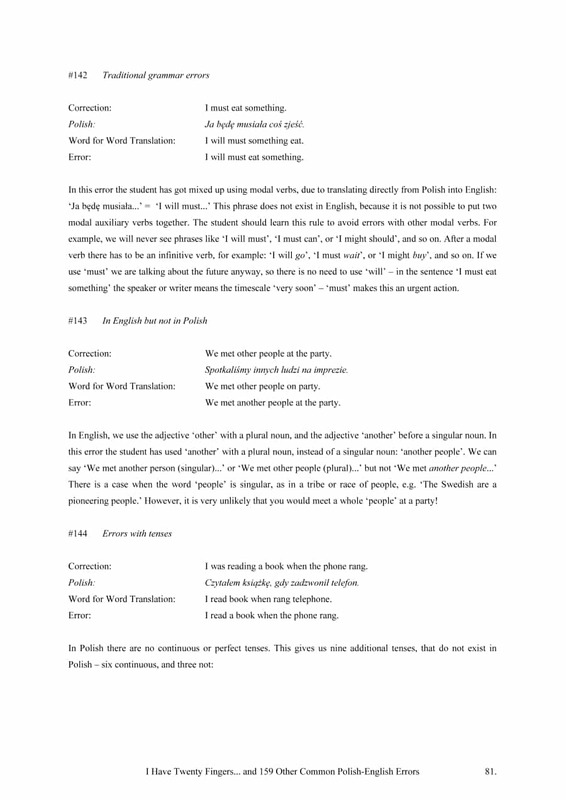 I have used it with three of my Polish students so far, and they have shown improvement already. When we are doing the tests, we discuss a lot if it’s what they would say in their own speaking, and they say: “This is exactly the mistake I would make!”. They feel more connected and involved, and it makes my teaching life so much easier! Thank you Matt for this amount of work you have put into this book! A must for teachers and Polish learners of English! ‘It works perfectly with A2-B1 students – they keep finding the things which are typical for them and it increases their motivation to learn). ‘I can see an extreme amount of work that you’ve put in that. The topic is complex, yet you managed to break it down the way a scientist would do, i.e. by patiently making a thorough case for each of the language mistakes you point out. Plus, the plain language (I mean the correct English) you used. I am impressed. That book was a real challenge. Buy your paperback copy today!